So much of the Northern Hemisphere is shivering under polar temperatures, winds, and vortexes that it has us all pining for a little warm sunshine. 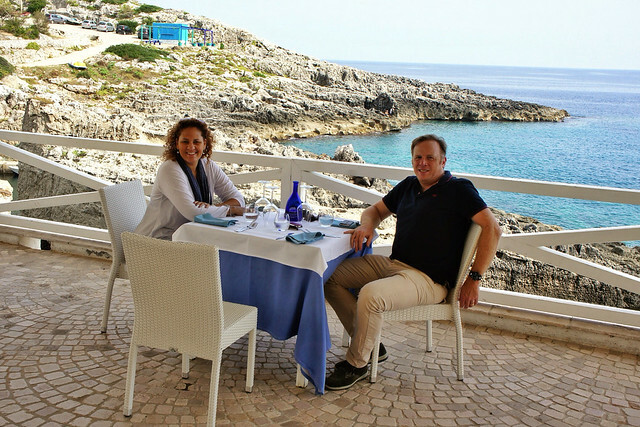 The snow and ice got Brian and Maria reminiscing about one of their last, unexpectedly balmy days in Italy, while traveling through Puglia’s Salento peninsula this past fall. They stopped at midday at Lo Scalo in Marina di Novaglie, but found that the restaurant hadn’t planned to open for lunch that day and had already stored away all their outdoor furniture for the season. Tweetable: Italy is a country where surprise and serendipity often combine, creating unforgettable memories. Though it was October 15th, the weather was perfect: warm and sunny, with a cloudless sky over the deep blue Adriatic sea. With just a bit of persuasion, the staff not only opened the kitchen but laid a picture-perfect table out on the terrace overlooking the water. 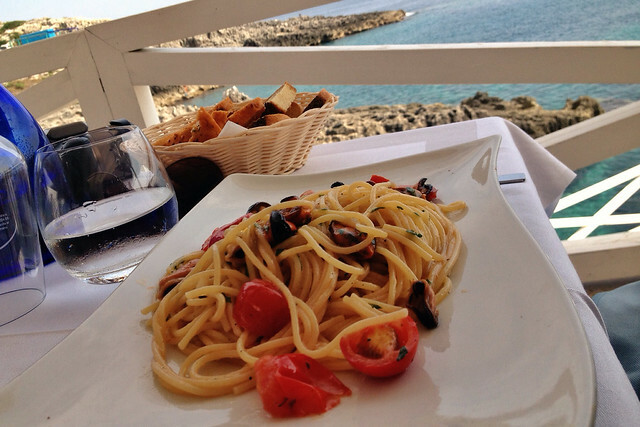 With the restaurant to themselves and the company of just a few swimmers in the lagoon below, Brian and Maria lingered over a simple meal of spaghetti tossed with mussels and cherry tomatoes followed by a plate of fried calamari, not wanting the day (nor the season) to end.